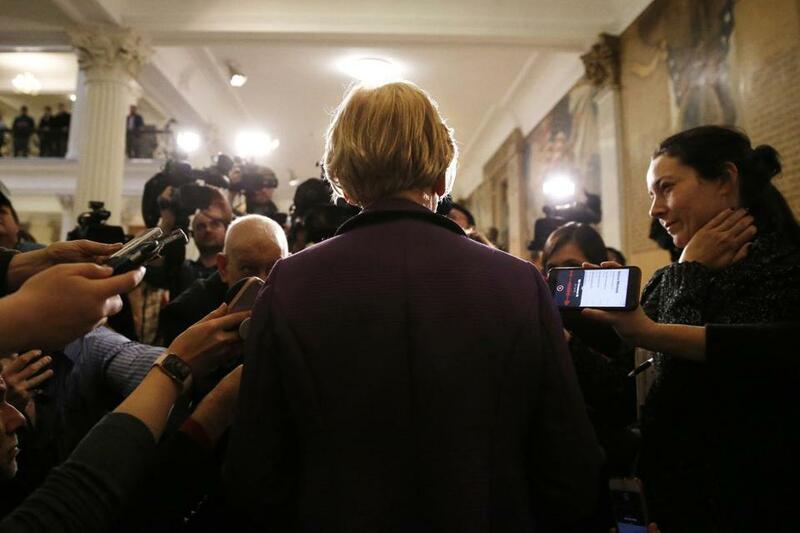 Senator Elizabeth Warren spoke to reporters outside of the first formal session of the 191st General Court of the Commonwealth of Massachusetts on Jan. 2. WASHINGTON — Senator Elizabeth Warren knew that if she wanted to run for president, she needed to finally put the lingering issue of her controversial claim to Native American heritage behind her. So last year she launched a methodical plan. First, she cleared the air: She told a national gathering of native leaders last February that she knew she was not a member of a tribe and vowed to fight for their issues. Then, she made her case: In September, she released a trove of documents to prove her claims did not help her get hired at Harvard or at any law school she worked at. Finally, in October, came the reveal. She unveiled the results of a DNA test that suggested she had a native ancestor 6 to 10 generations in her past. It was an attempt to push back on allegations by President Trump that she lied about her heritage, but it also sparked a backlash from some native groups that object to using DNA tests to prove claims of heritage. And, for all its attempted precision, last year’s rollout was missing one more thing some say should have been included from the start: a public apology for ever having claimed to be Native American with little more to go on than family lore. Warren’s attempt to offer that apology last week, along with the publication of a new example of her identifying as “American Indian’’ during a period in the 1980s when she was doing so elsewhere, has become an unwelcome distraction that threatens to slow her momentum days before her formal announcement on Saturday. Last Thursday, Warren called the chief of the Cherokee Nation to apologize for the “harm” she has caused to the understanding of tribal sovereignty. But Warren initially stayed silent publicly about what she apologized for, leaving it to the tribe to announce and explain the conversation. That left it unclear whether she apologized specifically for taking a DNA test to bolster her heritage claims — a tactic the tribe and others publicly slammed — or whether she was apologizing for ever having identified as Native American at all. The release by The Washington Post of a Texas state bar card on which she wrote her race was “American Indian” brought the issue back to full boil — at least within the Washington political class. Outside that circle, the impact is less apparent. The Cherokee Nation, for its part, says her brief apology was enough for them. Voters who attend her campaign events rarely bring her claims up. Many Democrats appear eager to leave the issue in the past, and Warren’s opponents for the Democratic nomination have largely avoided the topic altogether. But the episode has been a reminder that Warren, who has long possessed a gift for presenting complex academic ideas in a way voters understand, has not explained more proactively to voters what exactly she was sorry for, regarding an issue that has dogged her for six years in public office and marred her otherwise strong progressive credentials. Instead, she has repeated a fairly technical explanation, as she did three days in a row this week as reporters trailed her in the Capitol to ask about the apology to Chief Bill John Baker of the Cherokee Nation and the bar application. She suggested her apology was for identifying as native when she was not a citizen of a tribe. “Family stories are not the same as tribal citizenship,” Warren said. But any apology she has made has come either privately or in fits and starts in response to reporters’ questions, in contrast to the more deliberate way she released the DNA test in a highly produced video or explained her family lore in the speech to tribal leaders last year. Cornsilk is among those calling for Warren to explain why it was wrong for her to officially identify as Native American while at Harvard and the University of Pennsylvania as a way of educating other people not to unknowingly misappropriate native identity. “She can say, ‘I was wrong in checking that box and if you check that box you’re going to be wrong, too, because being Native American in this country is not about an eight generations back ancestor, it’s about the people who are living today in tribal communities with poverty, with unemployment, with drug abuse, with missing and murdered women,’ ” he said. Warren’s approach to the issue so far marks a contrast with how previous presidential candidates have addressed major campaign controversies, like Barack Obama, who gave a key speech about race to address comments made by his former pastor, Jeremiah Wright, when they drew negative attention. “Eventually you kind of need to call the question, and either give the speech and explain your thought process and say we’re moving on, or you stop answering every question from reporters,” said Jim Messina, who was a top adviser to Obama during both of his presidential campaigns. But it’s possible a less direct approach could work for Warren. Several tribal leaders, including Cherokee Nation Chief Baker, have said they have moved on from the issue. And it’s unclear whether the controversy will meaningfully hobble her case that she is the best candidate in a widening field to take on Trump. She has already built a formidable campaign operation and made more campaign stops than any other well-known presidential candidate. Trump’s constant taunts of Warren as “Pocahontas” — including a tweet where he referenced the massacre of unarmed Lakota Indians as part of a jibe at her — have also served to rally some to Warren’s side. None of her potential 2020 Democratic rivals has so much as touched the issue of her heritage, suggesting it could be less of a political liability in the primary than some are assuming. But Warren has shown a discomfort with engaging on the issue in the past, ever since then-senator Scott Brown tried unsuccessfully to use it to beat back her challenge in the 2012 Massachusetts Senate race. Six years later, it is something some progressives point to in suggesting she is out of step on a complex racial issue at a time when Democrats are trying to turn out more minority voters. “It’s just plainly absurd for her to have ever identified as Native American over white,” wrote Waleed Shahid, communications director for the Alexandria Ocasio Cortez-aligned Justice Democrats, on Twitter. “They feel like an attack on me and my mom but mostly on my grandmother, and my grandmother’s not around to defend herself,” Warren’s daughter Amelia Warren Tyagi said of Trump’s taunts in the video announcing Warren’s DNA test. Warren teared up when recounting the family stories she was told about her mother being part Native American when addressing the native leaders in Washington last year. “No one — not even the president of the United States — will ever take that part of me away,” she said. Liz Goodwin can be reached at elizabeth.goodwin@globe.com. Jess Bidgood is on Twitter at @jessbidgood and can be reached atjess.bidgood@globe.com.